Soon enough, we'll be seeing a fully updated Superman in The Man of Steel. But if you're feeling nostalgic for the Silver Age version, full of gee-whiz optimism and silly storytelling, then you should head to City Center in New York. While you can. 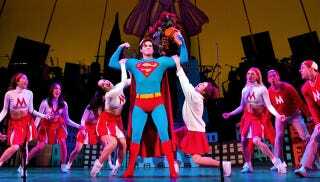 According to the New York Times, a new production of the 1966 musical It’s a Bird ... It’s a Plane ... It’s Superman is having a short-lived revival, through Sunday. Having watched clips of the 1960s run on Youtube, I can attest that this is one of the silliest pieces of musical theater of all time, and it's incredibly dated in its attempts to be "relevant" in the hippie era. Superman learns to "rap" with the youth, and so on. This isn't the only revival of It's a Bird lately — a few years ago, a Dallas company did a revival featuring the original songs but a whole new book by Roberto Aguirre-Sacasa, a playwright and writer of several Marvel Comics titles. Which makes it even more interesting that the New York production opted to go with the original book, rather than the updated, and possibly more self-aware, revised version. Anyway, see it if you can!